(AP) -- Documents released Friday by the Nixon Presidential Library show members of President Richard Nixon's inner circle discussing the possibilities of global warming more than 30 years ago. Adviser Daniel Patrick Moynihan, notable as a Democrat in the administration, urged the administration to initiate a worldwide system of monitoring carbon dioxide in the atmosphere, decades before the issue of global warming came to the public's attention. "This could increase the average temperature near the earth's surface by 7 degrees Fahrenheit," he wrote. "This in turn could raise the level of the sea by 10 feet. Goodbye New York. Goodbye Washington, for that matter." 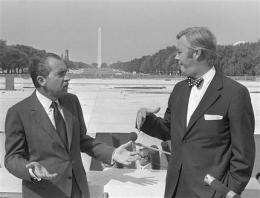 Moynihan was Nixon's counselor for urban affairs from January 1969 - when Nixon began his presidency - to December 1970. He later served as the U.S. ambassador to the United Nations before New York voters elected him to the Senate. Moynihan received a response in a January 26, 1970 memo from Hubert Heffner, deputy director of the administration's Office of Science and Technology. Heffner acknowledged that atmospheric temperature rise was an issue that should be looked at. "The more I get into this, the more I find two classes of doom-sayers, with, of course, the silent majority in between," he wrote. "One group says we will turn into snow-tripping mastodons because of the atmospheric dust and the other says we will have to grow gills to survive the increased ocean level due to the temperature rise." Heffner wrote that he would ask the Environmental Science Services Administration to look further into the issue. Nixon established the Environmental Protection Agency and had an interest in the environment. In one memo, Moynihan noted his approval of the first Earth Day, to be held April 22, 1970. "Clearly this is an opportunity to get the President usefully and positively involved with a large student movement," he wrote to John Ehrlichman, Nixon's adviser on domestic affairs. Moynihan's memo was among 100,000 documents released Friday. The documents also include about 5,000 pages of now unclassified national security records on the 1973 Arab-Israeli War, correspondence between Nixon and then-British Prime Minister Edward Heath and back-channel Soviet-Israeli relations. The new material is part of the ongoing effort to move Nixon's archives from Washington to Yorba Linda since the library came under federal control in 2007. "Moynihan, as Nixon aide, warned of global warming"
Smart man, always was a bit of a sissy. "discussing the possibilities of global warming more than 30 years ago." Er, you mean more than 40 years ago I think. The Apollo Mission returned with the first lunar samples in 1969. Analysis of elements implanted in lunar soils and breccias revealed solar mass fractionation. For 41 years (2010-1969) NASA has hidden evidence that the Sun (Earth's heat source) is a plasma diffuser that selectively moves lightweight elements like H and He to the top of the solar atmosphere. See: Physics of Atomic Nuclei 69 (2006) 1847-1856 or Energy & Environment 20 (2009) 131-144 and references to earlier papers cited there.